Sony’s second-gen Android slate, the Xperia Tablet S resembles a folded magazine. It is definitely one of the distinctive tablets in the market. Sony has kept much of the things same in its new product but has added some interesting new features and revamped the design. The Aluminum casing is the biggest change in design. Let’s find out more about Tablet S.
The new Xperia Tablet S is packed with a quad-core Tegra 4 SoC and runs Ice Cream Sandwich. Most of the hardware keys and ports are hidden out of sight, either buried behind a removable cover or within the folds. Around back, the Xperia Tablet S is a two-tier, two-tone affair. The 8MP on the rear is accompanied by an IR blaster. A charging dock and a dual speaker setup are located on the bottom. The OptiContrast technique has been used to keep the display visible in bright light and keep the glare to minimum. You can read the 9.4-inch screen even in the direct sunlight to some extent. The 9.4-inch IPS panel offers great contrast and colors. It has the resolution of 1,280 x 800. Overall, it offers balanced and crisp text, icons and images. Extra push to better readability is offered by the Super AMOLED displays. It handles 720p video perfectly, so you can watch HD movies and videos without any problem. The dual speakers on the rear base of the tablet offer enough sound inside a room. Two rows of Sony’s app have completely taken the primary home screen. The Sony Select app leads you to a curated app store. As soon as you power on the Tablet S you will content ecosystem of the company including Socialife, Walkman, Reader by Sony, Play Memories Online, Video Unlimited and Music Unlimited. You can get more established offerings from Google or Amazon. Google enthusiasts who have been using Jelly Bean may not find this device interesting, as it runs on Android 4.0.3. The company’s toolbar now borders the home screens, which offer some shortcuts to the settings menu, mail app, camera, browser and a Google search box on top. Shortcuts for Sony’s in-built TV Remote application and Guest Mode are also available. Some of the preinstalled apps include Zinio, Hulu Plus, OfficeSuite, Evernote, and AccuWeather. Most of these preinstalled apps can’t be uninstalled. The 8MP camera of Tablet S offers pretty decent pictures, though it is not the highest quality camera. The color is accurate and images are clear. The camera app offers the ability to reduce down the aspect ratio or resolution, toggle goetaggin and selectable scene mode. Distinct and clean video of 1080p is recorded by this camera. 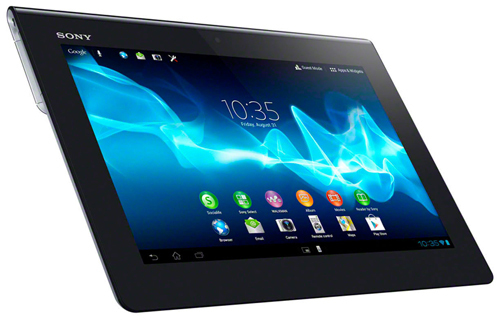 With a quad-core Tegra 3 SoC and 1GB of RAM Sony Xperia Tablet S offers smooth frame rates and impressive SunSpider result. The Tablet S is certainly a champion when it comes to performance. With automatically scale down backlight levels and additional settings options, the tablet of Sony fares on the power management front. The 6,000mAh battery offers the battery life of 8 hours and 31 minutes with normal use. Scott Garcia has been writing articles for different online magazines for several years. Visit our site if you want to know about iphone 5s release date and android apps vs iphone apps count.